In Britain, the Romans are our heritage. They gave us roads, towns, heating, baths, democracy, education, engineering, rabbits and turnips—and the lasting suspicion that anything that happened in the sun two thousand miles to the south had to be more fun than what we know up here in the wet and cold. They showed us how to run a decent army and a perfect bureaucracy. They taught us Latin so we could write fearlessly sentences with complicated clauses. They gave us wine. And we gave them a lot less than they thought they were coming to get. Our cold water oysters were better than theirs, but our gold and silver were more meagre than they had been led to believe. Then we trapped them in a situation where they could not politely decamp, because our rampaging Queen Boudicca had come within an ace of throwing them out—and they were macho Italians who then had to stay here to prove a point. I think one of the reasons we keep a sneaky liking for them is that knowledge that we caused them a lot of trouble with our red-haired queen and our druids. We British have a rebellious side that is often overlooked. When therefore, as a dedicated historical novelist who was desperate to break into being published, I made the then unheard-of choice of writing novels about the ancient world, it may have been with a slightly wicked feeling. I did it specifically because no-one else in Britain at the time was writing about the Romans and I could see that it would be easier just to copy an existing author—any existing author—but I opted to do my own thing. What’s more, I was always aware I was tramping in other people’s “stuff”; it took a long time to persuade the Italians to let me have the Falco series decently published in Italian. My first Roman novel, published though not for ten years, was the story of the Emperor Vespasian and his lifelong love Antonia Caenis; apart from the fact that theirs was a cracking good tale, I selected Vespasian precisely because he had been involved in the invasion of Britain, my own country and the place where I stood most chance of being first published. The first Falco novel grew out of that book, and again it deliberately had a plot involving Britain and a long central sequence where my hero had to come here and have a horrible experience. This was the only way I could convince suspicious publishers that there was something in the ancient civilisation they viewed so doubtfully that would appeal to readers. It had the big advantage for me as a writer that I could field the wonderful contrast between the Mediterranean and our world, a subject to which I return regularly just for the hell of it. Of course the publishers’ doubts were ridiculous. What readers want, and they want it very badly indeed, is the other stuff—the stuff in the south. Yes, there will always be a minority who write and ask me to take Falco to their own home town (they forget how rabidly he insults every place he visits outside his beloved Rome). The rest know what’s what. They want people sitting outside backstreet restaurants on baking hot days, drinking a flagon of fruity Capanian red while waiting for a dish of peppery fried squid, as a haze of fresh oregano wafts over them and the handsome but cynical waiter quietly doubles the bill. They want alleys where multiple washing lines hide your view of whoever is having the loud raging quarrel and whoever is sneaking up to pick your purse. They want esoteric details like laundry cleaned in human urine and ketchup brewed from fish entrails and sixty-seater public lavatories that have no individual cubicles. They want civilisation—sewers and the Senate—and things we don’t call civilised—slaves, gladiators and women rating no legal identity. Some of them want the Christians, and they actually seem to enjoy it when I always have the Christians beaten up. Above all, they want and need Italian sunlight simmering on Travertine in the long lazy days of Mediterranean summer. A sea so bright and blue you can hardly stare at it to search for the sailing ship that brings a desperately needed cargo, a feared adventure, or an unexpected lover. Life lived at a pitch that matches the bright sun, and—in mysteries, anyway—death as dark as the sudden chilly shade. Lindsey Davis has eighteen novels, all in print, beginning with The Course of Honour, the love story of the Emperor Vespasian and Antonia Caenis. 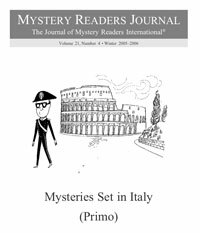 Her prize-winning series, featuring laid-back 1st century detective Marcus Didius Falco and his partner Helena (plus their friends, relations, pets, and bitter enemy the Chief Spy), has been translated into many languages, and serialised on BBC. I first came to Italy in 1967, escaping from both graduate school and a copywriting job in New York. My family is the usual American mixture: Irish, German, Spanish: no Italian. I arrived speaking only the words and phrases I’d picked on the sea crossing, though once I arrived in Naples and then went on to Rome, I quickly realized that these were people I wanted to listen to and wanted to talk to. And as time passed, wanted to live among. That took fifteen years to happen, for I kept taking jobs in odd places: Iran, China, Saudi Arabia. Finally, in 1981, after a terrible year in Saudi Arabia, I decided to move to Venice where I had, over the course of years, managed to acquire friends at the level of family. Thus my move was motivated by sentiment, not the rich cultural heritage of the city. The people I’d come to love lived there, and so there was no other choice. After some months, I found a job teaching English literature for the University of Maryland, which had the contract for university education for the US Armed Forces in Europe. And so I whiled away fifteen years talking to our boys in blue about the changing moral order in the universe of Jane Austen’s novels or the unreliable narrator in 20th-century fiction. They might perhaps have resisted Jane Austen, my students, but they knew a lot about changing moral orders, and they’d certainly encountered a large number of unreliable narrators. In 1989, I had a conversation with the Italian conductor Gabriele Ferro, in which he and his wife talked badly about another conductor. There followed an “escalation,” during which we discussed ways to kill him, and it occurred to me that it would be an interesting opening for a crime novel, to find a conductor dead in the dressing room where we were having the conversation. Fifteen years later, I find myself still writing about the man who went to investigate that original crime, Guido Brunetti. He’s Venetian, in middle age, married to a university professor, with whom he has two children, Raffaele and Chiara, both in their teens. He’s a thoughtful man, much given to reading and reflection. His preferred authors are the ancient historians, for he feels great sympathy with their lack of illusion about humanity, politics, and society. Because his family has been Venetian for centuries and because he has lived in the city for most of his life, he has access to information that might prove difficult for a non-Venetian to obtain. Because he has a certain gentility and ease with people, they are prone to talk to him and often reveal more than they realize. Donna Leon‘s latest Commissario Brunetti mystery is Blood from a Stone. Her fifteenth novel, Through a Glass Darkly, will be published in April 2006. She is the winner of the CWA Silver Dagger award. While not working on the Brunetti books, she is involved with Alan Curtis in managing his orchestra, Il Complesso Barocco, and in producing a series of recordings of Handel’s operas.